Tom Gebhardt on voice recognition: "It's very bipolar. Either you use it three times and hate it and you won't try it again, or you get used to it and you really like it." How can automakers help motorists who struggle with voice recognition, the technology that generates more customer dissatisfaction than any other in-vehicle gadgetry? 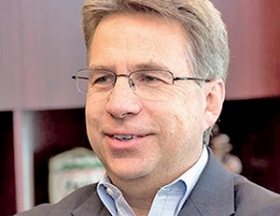 Tom Gebhardt, president of Panasonic Automotive Systems Co. of America, believes he has a solution: an infotainment system that learns users' preferences, then asks them what they want. He says Panasonic, a leading infotainment supplier, will introduce its "smart" voice technology in January at the International CES in Las Vegas. Gebhardt, 54, spelled out his vision for infotainment during a Sept. 9 interview with Staff Correspondent David Sedgwick. Q: Does Panasonic Automotive expect revenue to rise about 10 percent this year, as it did in 2013? A: Globally, it will be a little bit less than that. For North America, it would be a little bit more. What generates the most growth for Panasonic in the United States? Our infotainment business is our best business. That's the thing that has powered us over the last five years, and that continues to be the real core. What infotainment product has generated growth? Panasonic has been an "imaging" company for some time, with cameras and camcorders. We've got a good understanding of images and displays. So when automakers put more cameras in the vehicle, that's a real positive for us. And the displays in a vehicle are a positive, too. Is the head unit, the control box in a vehicle's instrument panel, still your primary infotainment revenue generator? Yeah, that's a solid core product, and we build around it. The Cadillac Cue infotainment display is a Panasonic unit. Are capacitive touch screens, those controlled by the touch of a finger, the wave of the future? Some touch functions are highly effective. In fact, you get so accustomed to a tablet's touch functions that you almost need to have some of that functionality in the car. Will automakers finally give up knob controls? People still like to have the combination of a touch screen with control knobs. They can't give up the knobs. And it does get distracting if you try to adjust audio volume and some other functions on a touch screen. So the answer is some kind of hybrid display. Does voice recognition work well enough to satisfy most motorists? Our data shows that 50 percent of the people love it, and 50 percent hate it. It's very bipolar. Either you use it three times and hate it and you won't try it again, or you get used to it and you really like it. Will that love-it-or-hate-it split continue? As the technology continues to improve, we believe more people will start to gravitate to it. But you've got a big learning curve with some people who had early generations [of voice technology] and became dissatisfied. They've got to get over that hump, and that will take some time. How would Panasonic make voice recognition acceptable for motorists that don't like it? We think we have to ease them into it because they aren't going to jump back into it. We have to take it to another level where it's not so complicated, so that the motorist is in his comfort zone and doesn't have to ferret through a menu of 30,000 selections. We need to make it easier, with a smaller number of selections. How would Panasonic pare down the list of commands so the motorist has a higher chance of success? Imagine if you had your own preferences already set up -- Dave's morning, Dave's afternoon, Dave's weekend. So if it's Saturday, the computer knows that I always listen to "Wait Wait ... Don't Tell Me!" on NPR? Right. That's the way we believe it will ultimately work. The computer says: "It's Saturday morning, Dave. Do you want to listen to this?" You could make a simple response -- yes or no -- and you'd be more likely to connect. Can Panasonic create a simple yes-or-no sequence of commands? Right. Imagine that your infotainment system understands your habits. When you pull out of the driveway and go in a certain direction, it could say, "Dave, are you going to work?" And you could say, "yes." So now the computer knows it's Monday, and I usually listen to NPR. And it asks me if I want to listen to the news? And it could ask me if I want local news or national news? Yes, that simplifies it. You have a conversation that the computer understands. The whole point is to simplify the things that motorists don't like, so that they will use them. That's the answer to voice technology. Simplify it. To make that work, you need an infotainment system that can learn your habits. We'll demonstrate that capability at the next CES show [in January]. Pandora's streaming radio app has the ability to learn users' likes and dislikes. Did Panasonic study Pandora? I don't know that it was Pandora specifically. Facebook has learning algorithms. Google is the master of learning behavior. There are all sorts of tech companies that use this incredibly well. Does Panasonic have the software and hardware that can make this work? When you use the cloud, the possibilities are pretty infinite.